I first had this stew in a small vegetarian restaurant in Guelph, Ontario and it was love at first bite. 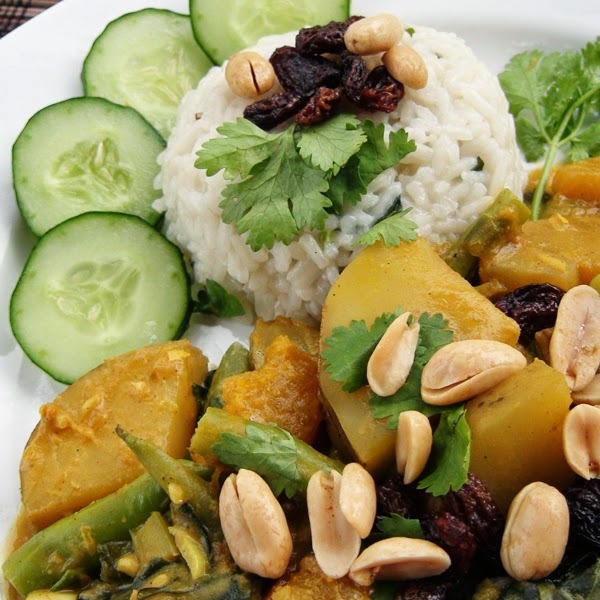 This hardy dish combines the amazing flavour of peanut with pumpkin, potato, beans and ginger into a serious comfort food. Although there are a lot of ingredients, this is an easy dish to create and can be cooked in under 20 minutes. Boil the potato and pumpkin until soft. Drain and set aside. Lightly sauté ginger, garlic, scallion, turmeric, and cumin in oil for 2 minutes, just enough time to let the flavours blend. Add potato, pumpkin, green beans, miso, coconut milk, cinnamon and peanut butter. Simmer for 5 minutes, stirring to make sure the peanut butter dissolves. Serve with rice or couscous with peanut, sultanas and cilantro as garnish.